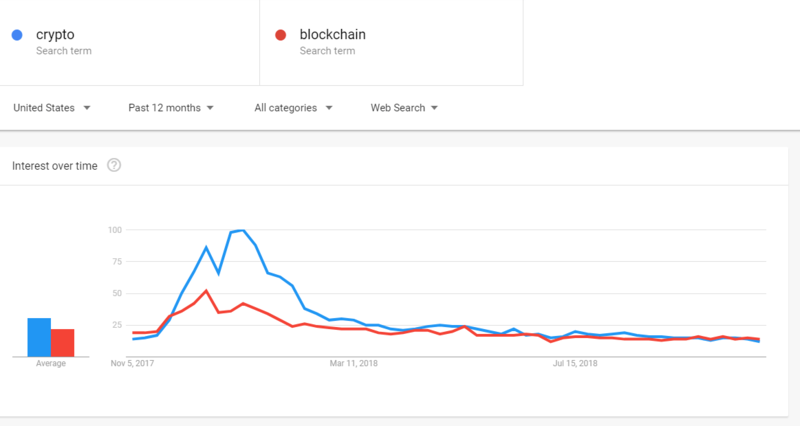 On Google Trends, the keyword “blockchain” has surpassed “crypto” in popularity in recent months, suggesting that the demand for the asset class has dropped in comparison to the underlying technology. Throughout the past eleven months, since January, the cryptocurrency market has suffered a 75 percent drop in valuation from $800 billion to $200 billion, as major cryptocurrencies like Bitcoin and Ethereum lost nearly 70 percent of their value. “To be honest, with volume and volatility petering out, I wouldn’t be surprised to see BTC hold this range for another month (and maybe till the EOY too). Would be the path of maximum pain, bears don’t get their rapid selloff to 4.8k, bulls distraught over not being able to break 6.8k”. As seen in the struggles of technology behemoths IBM and Microsoft to convince large-scale conglomerates and supply chain operators to adopt private blockchain networks, the blockchain has not demonstrated its potential over the past three years. Banks, financial institutions, and technology firms have allocated billions of dollars per year to develop enterprise-grade blockchain networks with a focus on scalability over security. Yet, the blockchain has not seen massive mainstream adoption. Ripple Labs, considering the utilization of the Ripple network by Banco Santander’s new mobile application and 61 major banks in Japan, has shown some potential of the blockchain’s current applicability in traditional finance. In general, however, companies have found it challenging to integrate the blockchain into existing infrastructures of large platforms. Rolf Jansen, the CEO of Hapag-Lloyd, a transnational German-based transportation giant, stated that conglomerates have been skeptical towards the adoption of private blockchain networks because the core purpose of a blockchain is to eliminate trust and private networks involve trust at a certain level. In contrast to the private blockchain industry, the cryptocurrency sector has seen many of the most positive developments in its 10-year history. ICE/NYSE-backed Bakkt announced the launch of a Bitcoin futures market while Goldman Sachs is preparing to clear cryptocurrency derivatives in the short-term, and leading banks like Morgan Stanley are currently testing cryptocurrency-related systems. Yet, the trend of the term “crypto” and “cryptocurrency” has been on a decline and have been taken over by a keyword that represents a stagnant industry struggling to find significant success throughout the year. What Can Lead the Recovery? But, as of now, eleven months in a bear market, it is evident that the demand for crypto from retail traders has noticeably decreased as shown by Google Trends and the low volume in the cryptocurrency exchange market. Could Bakkt Bitcoin Futures Market Launch in December Lead to ETF Approval?